Think about your running goals. What are you trying to change or improve? If you want to run a marathon, run long. If you have a marathon goal pace, train at your marathon goal pace. Consistently running slower than goal pace will not help you on race day. If you are training to run a fast 5k, you need to run fast in your training. Not quite at your goal race pace yet? Start with conversation pace running to build cardiovascular fitness and add in Fartlek runs and interval training. Gradually increase your speed and/or distance and decrease your recovery periods. Remember: if you want to run fast in a race, you need to run fast in training. It seems so simple, right? Changing too many variables in your training can also become a problem. It takes about 3 weeks to start seeing improvements and up to 6 weeks to adapt to new training stresses. If you change too many variables at once, it’s hard to tell what is working for you and what is not. Cross training and strength training are very important for runners. However when talking about Specificity of Training, not all cross training will benefit your running. In a good fitness program, you will train the whole body. Focusing on an upper body routine will not help build muscle fibers in your legs and vice versa. On a similar level, walking 18 holes and swinging a golf club will not help your running. Neither will running back and forth on a tennis court. Yes chasing tennis balls will increase your cardiovascular fitness but how often in running are you moving laterally in a road race? In fact, the side-to-side movement in tennis is risky and can lead to an increased chance of injury for someone that is consistently training in a straight line! American distance running legend Frank Shorter once said, “The key to running is to develop the neuromuscular patterning that enhances running.” This translates to cross training. Running-specific cross training not only improves cardiovascular fitness but also includes similar running movement patterns. 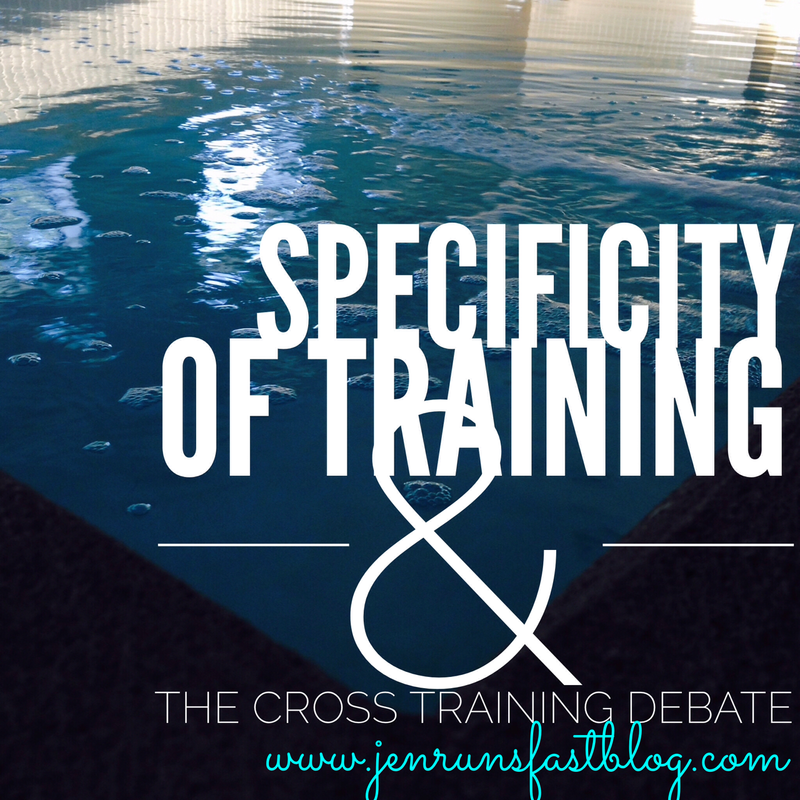 What are examples of running specific cross training? Aqua jogging, swimming, biking, cross country skiing, and using an elliptical or EllitiGo. These are often go-to activities for the injured runner or in place of a run. Movement patterns mimic running while at the same time working the cardiovascular system. Weight training, while necessary for runners for other reasons, should not take the place of a run. Neither should yoga or Pilates. The RRCA recommends 2-4 efforts per week. An effort is “a workout different than normal workout” and includes the week itself, long runs, fast runs, cross training, strength training, etc. Again, think about your running goals. What are you trying to change or improve and what other activities are you participating in? Are they helping or hurting your running?